Now that we’ve had a chance to look at the common Series7 architecture, let’s take a look at the features and properties of Series7XT in particular. Series7XT will be offered with 2 optional feature additions. The first is the aforementioned FP64 ALU, which is being offered as part of what Imagination is calling the HPC Feature Pack. As FP64 operations are not necessary for graphics work (and often even FP16 will do), the FP64 functionality is being offered to customers who want to build HPC hardware out of Series7XT. 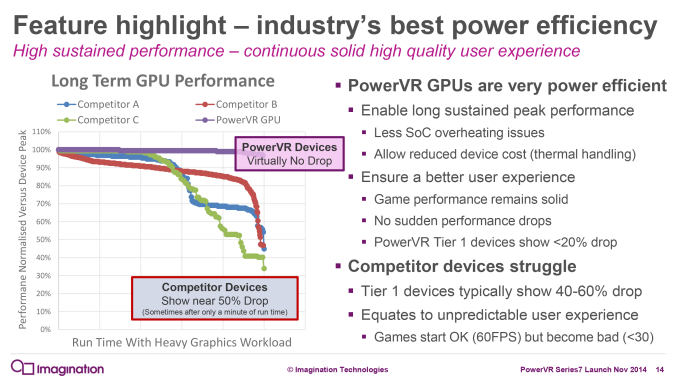 PowerVR hardware has up until now not been a competitor in the HPC space, so this marks a significant turning point for Imagination and would have them challenging frontrunner NVIDIA in this space. Also of note here, as the base 7XT configuration only supports OpenCL 1.2 Embedded Profile, the HPC pack upgrades 7XT’s OpenCL capabilities to 1.2 Full Profile. Meanwhile the other optional feature pack for Series7XT is the Direct3D 11 pack, which is primarily geared towards customers who would be building Windows Phone and Windows RT devices. Imagination made Direct3D 11 an optional feature on 6XT, and is doing the same on 7XT. In the case of 6XT the D3D option would have added the necessary tessellation capabilities that are now default on 7XT, so for 7XT this is likely more about D3D features such as S3TC that require additional licensing. 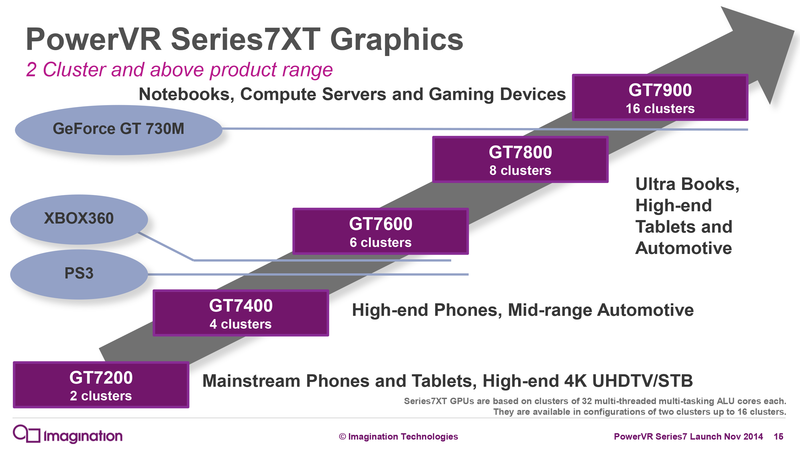 Moving on, for as much as Imagination’s various enhancements ultimately improve performance, really it’s power efficiency that’s driving most of Imagination’s performance gains, and 7XT in turn is designed to further improve on Imagination’s power efficiency. Unfortunately Imagination isn’t throwing out any numbers here – just that 7XT can offer similar performance as 6XT for less power – but on the subject of power efficiency they have documented their efforts to deal with throttling. To be clear here this is a matter ultimately in the hands of SoC integrators and is not something Imagination can directly control, but as a supplier they can offer advice and suggestions to their customers to improve the experience. Short of making PowerVR GPUs low power in the first place (and this is something everyone in this space tries to do), the next best thing they can do is to encourage customers to be mindful of throttling and to discourage designing their clockspeed governors to be bursty. While the “hurry up and go to sleep” motto makes a lot of sense for CPUs, it makes less sense for GPUs due to the fact that most workloads are sustained. By providing good real-time power usage data to the OS and by discouraging high maximum clockspeeds that lead to burst-and-throttle behavior from governors, for Series7 Imagination is at least trying to ensure that throttling is minimized. Finally, Imagination has outlined the different configurations that Series7XT will be available in. Starting in 2 cluster configurations, 7XT scales up to 16 cluster configurations, or twice as large as 6XT. 2-4 cluster configurations are expected to be used in phones and TVs, meanwhile 6-8 cluster configurations are expected to be used in tablets, automotive, and ultrabooks. 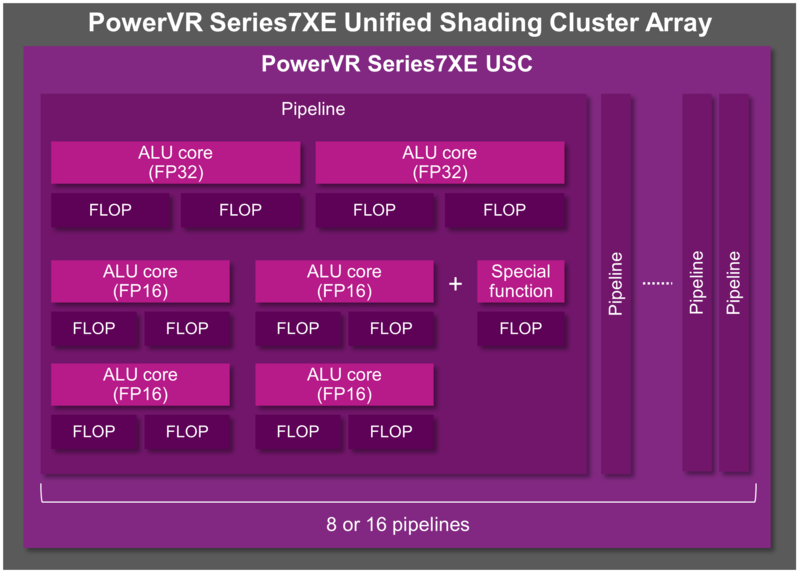 Finally the 16 cluster configuration would be targeted at non-traditional spaces for PowerVR products, such as full notebooks, dedicated (set-top) gaming devices, and servers. 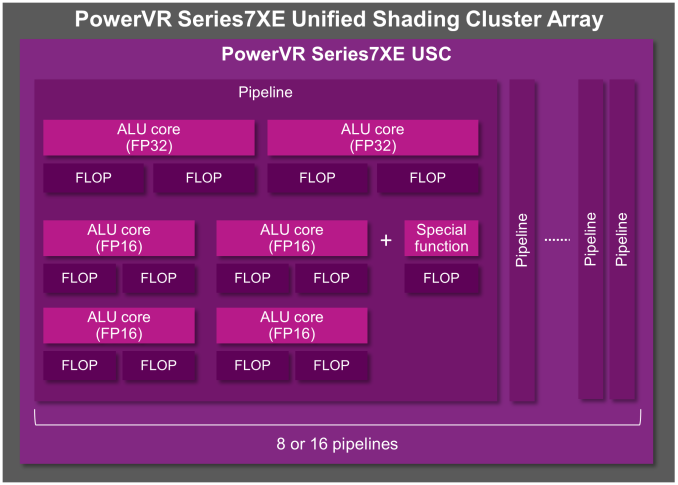 With a hefty 512 FP32 ALUs Imagination expects that the 16 cluster configuration should rival lower-end discrete GPUs, which would certainly be the competition for the device categories that Imagination is chasing. Moving on, at the other end of the spectrum we have the Series7XE GPUs. 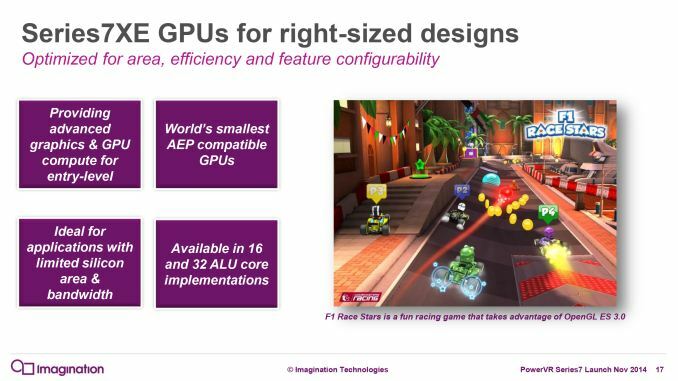 These products are the successors to the Series6XE GPUs, and like their predecessors are focused on a narrower feature set for low cost devices, with an emphasis on area efficiency over power efficiency. 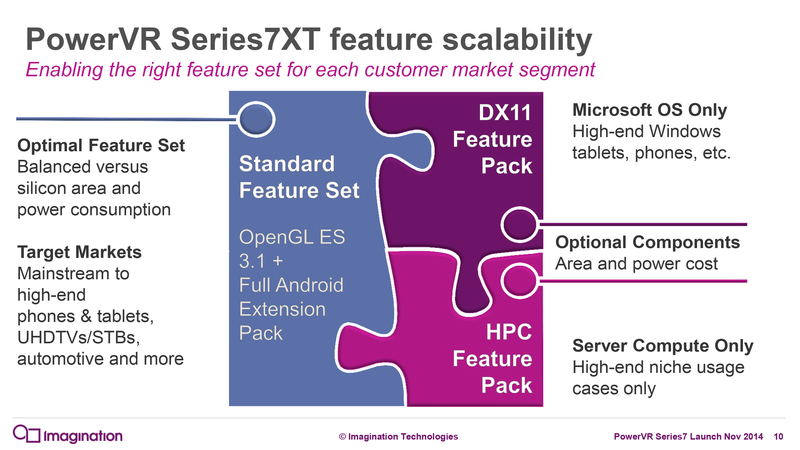 Of the Series7 features we’ve covered so far, Series7XE gains access to virtually all of those features. However a larger number of those features are optional and are not in the base configuration. Of note, all of the general enhancements for the frontends and the USC are carried over for the base configuration. However the tessellation block (and hence AEP support) is optional. As a result 7XE has 4 optional feature packs to build on top of its base OpenGL ES 3.1 functionality. The AEP adds the tessellator and other AEP-centric functionality from 7XT that isn’t in 7XE’s default configuration. Meanwhile the Compression Pack segregates certain compression features from 7XE so that they’re only included in designs that need them (since SoC manufacturers may want to use 3rd party compression technology). HEVC and 10-bit YUV support is also optional for 7XE, and finally the virtualization features we discussed earlier are optional as well. 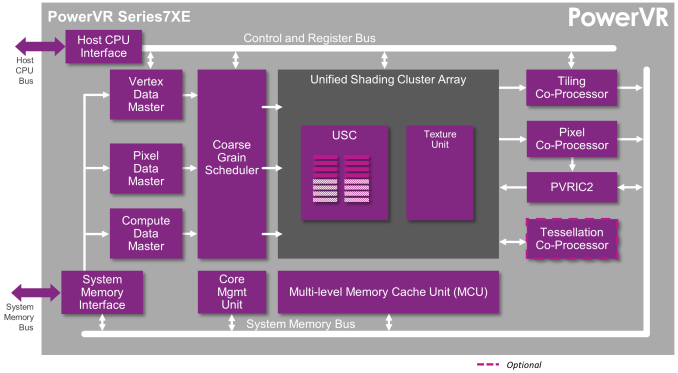 Since 7XT is targeted at 2 cluster and above configurations, 7XE is designed to cover the 1 and ½ cluster configurations. This results in 2 configurations, the GE7800 which implements a full cluster, and the GE7400 which implements a half-cluster. With the 1 cluster configuration targeted at low-end phones and TVs, the half-cluster configuration will be in the cheapest and simplest devices, along with being a candidate for high-end wearable devices. 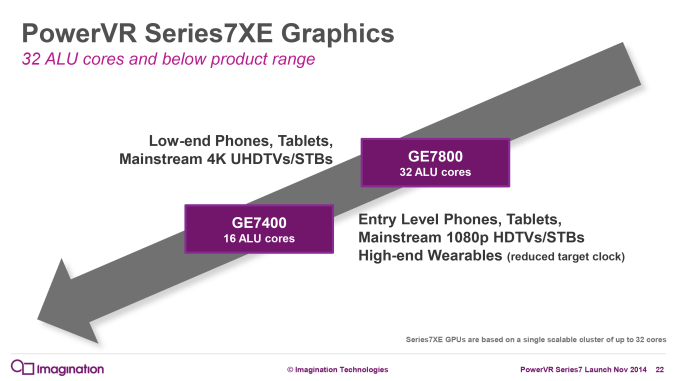 Imagination says that at the low clockspeeds they’re envisioning for 7XE wearables, the full load power for the GPU would be under 1W, with low/idle power consumption of course being much lower yet. Any kind of power consumption approaching 1W definitely also approaches a “high-end” niche for wearables, but none the less it is viable if for any reason someone needed to build a wearable device that could handle OpenGL ES 3.1 graphics. Seeing "these should be taken with a grain of salt" comment, I wonder if anyone ever did comparison of past announcements and how accurate they were? Was Imagination announcement for 6XT close to reality? How about similar pre-release figures given by NVidia, Intel etc... ? It's kinda silly to say only Tegra and Apple exist on the SoC market at the moment - The fact that those two happen to have just had their latest designs put to market in high profile tablet devices. There hasn't been a high end ARM tablet put to market in recent months that wasn't Tegra or an iDevice. So sure, they are technically winning that extremely specific race, but in the wider mobile sector (which uses the exact same SoCs most of the time) no-one has a clear lead. The most recent Snapdragon flagship won't be around for a while yet and the Exynos 5233 was only in some Note 4s and is yet to be in a mass market device, there's no suggestion that either of those two won't be competitive with the Apple and Nvidia going forward. Obviously more recent chips tend to be better, so the ones we've seen most recently are very likely the most powerful of what there is at this exact second. But they certainly don't blow anything out of the water. Apple and Nvidia are doing good at this exact moment. Their chips compare well in benchmarks to what else is on the market. But those benchmarks are certainly not much ahead of what was on the market when they were released, and there's absolutely nothing to suggest that they are now somehow ahead of Qualcomms next generation, and the Exynos 5 series is certainly on par with them. When the Tegra 4 came to market it was impressively ahead of the curve in graphics especially. But sadly no-one bought into all that much back then, and everyone else has continued pushing on with their own designs and closed that gap to the point where it's an even race. There is no generation gap what so ever. And the thing is that none of this is even relevant anymore anyway. Mobile devices don't need better graphics. We don't make use of what we have already. Even if you do happen to be 15 and (somehow) have a flagship phone I severely doubt even someone with your buckets of free time and large periods waiting for buses and/or being driven around actually appreciate the (slight) difference between this years and last years flagships in terms of GPU power alone. Beyond that the amount of CPU horsepower in modern devices is laughably overblown now to the point where outside benchmarking you genuinely have to try very very hard to tap even a fraction of what the processor can do. At this point in the evolution of the mobile space the specs just don't make enough of a difference to wow people now. Last years flagships are still fine devices. The year befores are too. And the year befores. They might not all have the latest software, but they still do what they originally did just as well as ever they did it. When first Tegra 4 came out, there already was Snapdragon 800(devices with those SoCs came out in summer 2013). When first device with Tegra K1 came out(Xiaomi MiPad), there wasn't anything, that could compete with it. When second device came out(Shield Tablet), there still wasn't anything. And when third K1 device came out(Nexus 9, with dual-core Denver CPU) there was ONLY iPad Air 2. 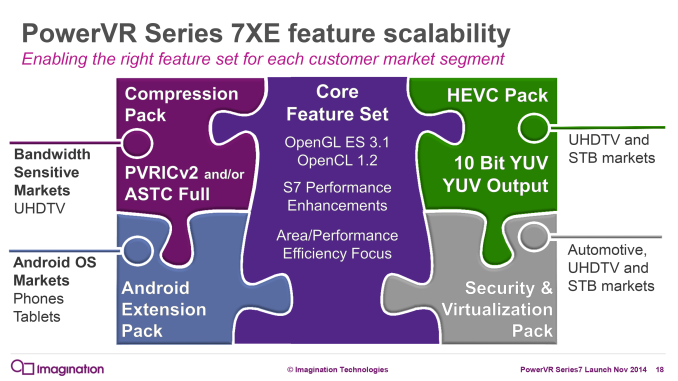 K1 and A8x are the most powerful ARM SoCs right now, and that will be changed only in 2015. Exynos 7 Octa and Snapdragon 805 cant compete with K1 or A8X. But, there is one major problem with K1 and A8X - these are SoCs for tablets, not for smartphones. Exactly, and Nvidia still has 2 major trump cards to play with Erista which will have both 20nm and Maxwell GPU arch, so they'll extend their lead again as early as Q2. Who's buying into the hype when there's no need to? The latest two products on the market show Nvidia and Apple are head and shoulders above the competition and there is nothing on Qualcomm's roadmap that will challenge this until maybe next year, by which time Nvidia for sure will have punted the ball out of their range again with Erista (Maxwell and 20nm). Apple won't have as many levels to pull to improve A9, unless they also go with Maxwell GPU IP.